Calling all Frabelle food products consumers! 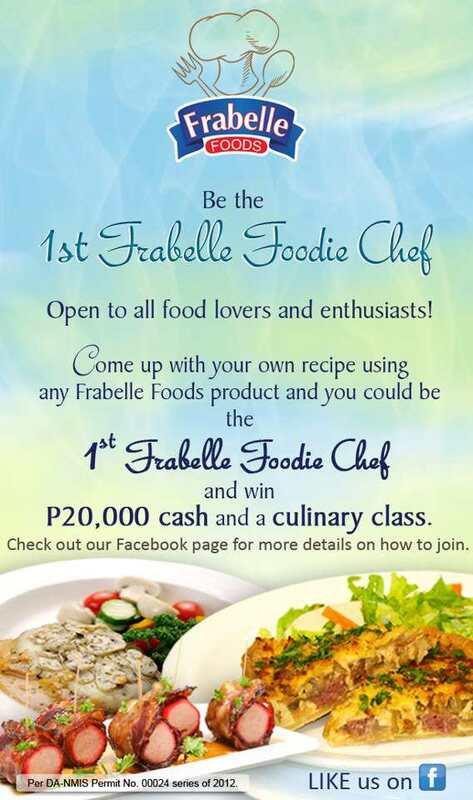 Frabelle's 1st Foodie Chef cooking contest is open to all! The mechanics is pretty simple. All you need to do is come up with an original recipe using any of the following Frabelle food products: hotdog, cheesedog, pork ham tocino, longganisa hamonado, honey ham and hickory smoked bacon. The contest is from October 22 to November 30, 2012. Just click on the link for the mechanics of the contest. The price? It's 20,000 php plus a culinary class! I wonder if I can I join.